Gina McCarthy, the Administrator of the federal, Environmental Protection Agency (l.) and U.S. Senator Angus King (r.) at Smiling Hill Farm in Westbrook learning about how a new clean water rule would affect smaller farmers. The Environmental Protection Administration chief was in Maine this morning, trying to re-assure Maine's smaller farmers that a new, clean water rule won't affect them. But national farm groups are saying they don't buy it. 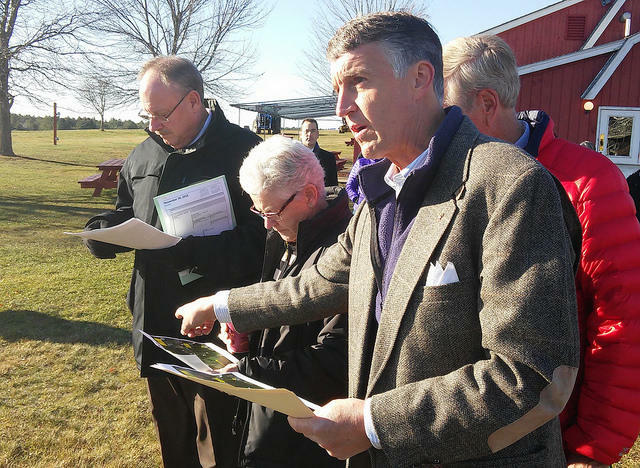 Irwin Gratz reports on EPA administrator Gina McCarthy touring a farm in Westbrook. 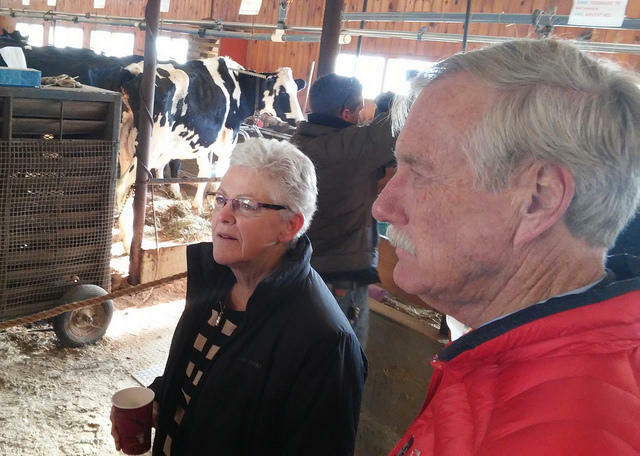 It's impossible to know why the cows at Smiling Hill Farm were sounding off this morning as EPA Administrator Gina McCarthy toured a barn with Sen. Angus King, Smiling Hill Farm President Warren Knight and others. But McCarthy understands full well why farmers have been sounding off about her agency's new rule. "This is not about continuing to enhance regulation on agriculture, but continuing to make it easier for them to understand how they do the work that's so important to all of us," McCarthy says. The rule would protect additional streams and wetlands that provide drinking water under the Clean Water Act. Some of those small ponds or other wetlands may be on farms, which is why some farmers worry that diverting a small stream or filling in a wetland could get them in hot water. But Administrator McCarthy insists exemptions already in place for farmers won't be affected by the new rule. "We're not going to require new permits for agriculture. We've actually expanded exemptions. So we think we've done a good job, not just in protecting agriculture while we're protecting water quality, but doing it in a way that allows them more freedom to continue to do the work that's so important to all of us." The American Farm Bureau, on a website titled "Ditch the Rule," describes as "laughable" that the new rule will only affect about 1,300 acres of land nationwide. Maine Sen. Angus King, who invited McCarthy to come to Maine, says the federal government should tread lightly on the operations of smaller farms. Curt Spaulding, Regional Administrator, EPA (l.); Gina McCarthy, Administrator, EPA (c.); Warren Knight, President, Smiling Hill Farm (r.); (US Senator Angus King is in red jacket in the rear). "We just had a vote in the Senate on some bills that I think, frankly, went too far in undercutting the Clean Water Act. but, at the same time, we just want to to be sure the farmers have clarity and understand what the rules are. And, that we don't convert them into a situation where they have to, constantly be getting permits and hiring lawyers and soil scientists." The new EPA rule has been stayed by a federal judge, pending resolution of a lawsuit challenging it. McCarthy says EPA will, in the meantime, try to prove it friendliness to farmers by implementing current environmental rules in ways that provide exemptions farms say they need.